All I can say is; the more I see of this country, the better it gets! It was lovely to receive our first visitors since arriving here. Jim and Ana drove from KSA (Kingdom of Saudi Arabia) and arrived last Thursday, they were here for a few days. It was great timing that the temperature has dropped just about enough to go and do things outdoors (just about). We popped into Souq Wakif (more info) for the first time. 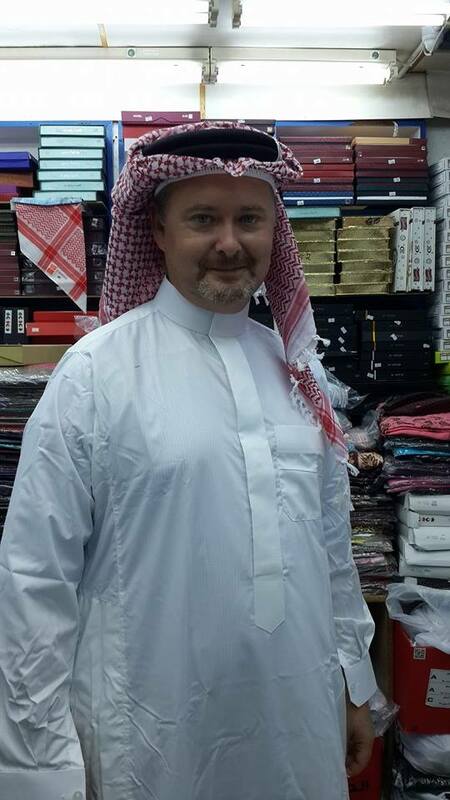 We had a wander during the day time, Jim marched me into one of the little stores in the Souq and some 20 minutes later I was fully kitted with thobe and gutra (thanks Jim, I love it!). Today, Friday we went out to investigate a bit, we decided to go out of the city to see what’s around. We ended up at Al Dosari Zoo and Game Reserve which is approximately 30 minutes from home. We arrived at around 9:30 and people were already starting to arrive. We parked up and started having a wander. Not long after a smartly dressed gentleman arrived in a golf buggy, it turned out he was the owner and has privately funded this place for the last 30 years. Admission is free, there are shows and horse rides as well as camel rides and loads of entertainment for children and adults on Fridays. Families were turning up in droves, setting up their “picnic” and having a jolly good time. He (the owner) was going round all the different camps saying hello to everybody and having a chat. It turns out that groups would arrange to bring different stuff, pots and pans (family size stuff), set up a camp fire and enjoy the day, how cool is that! There were Sri Lankan, Indian, Pakistani, Bangladeshi and loads of other camps, all having a great time with friends and family! He gave us the full tour of the whole place in his buggy, took us fishing and personally took great care we were well looked after. Once he had shown us around all the animals and facilities having made sure Katja got to feed the goats and rabbits, he showed us the admin side along with his collection of stuffed animals. Before we continued with the tour we stopped for a cup of Kahwa Coffee (click for more info) and chatting a bit more about lots of different stuff. As we were walking past one of the shops on site he invited us to some drinks (soft drinks of course) and he gave Katja a large inflatable duck, which she cuddled for the rest of the trip! I can’t think of many (or any) other countries where something like this would happen! We decided to leave soon after as it was now 11:40 and it was getting quite hot. We decided to head off without using the GPS and see where we would come out. Eventually we came out onto a motorway towards the north west and made our way back to Doha. We will go back when the weather cools down more and spend the afternoon there as I am sure it will be fascinating to watch all these shows, even better still, I am looking forward to participating!